Camera Bag or Everyday Fashion Item? Now don’t you worry, I am not going to pretend to know something about fashion or the coffee club culture but this review is going to have a twist. To try offer a balanced perspective, Rikki is going to be our more fashionable, female and should we say modern reviewer, while I, Tristan will apply the more conservative… perhaps typically South African male point of view. 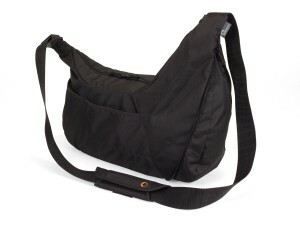 The Lowepro Passport Sling is a comfortable and fashionable camera bag that you wear across your body. I particularly like the design because it doesn’t necessarily look like a camera bag, meaning opportunist thieves will probably not give it a second glance. 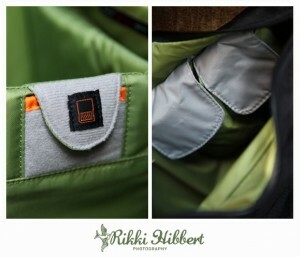 The strap is adjustable, so you can wear the bag low or high, and the excess strap neatly tucks away. I found the shoulder pad to be a little annoying, so I removed it. Personally I think the bag looks better without it. Now lets talk compartments. As a woman, I carry a lot of stuff around with me, not all essential, but it’s comforting to know it’s there. Just in case I may need it! Exterior: There are 2 fairly large and deep side pockets for quick access items, like mobile phone, lip-gloss, mascara, field journal and other essentials. 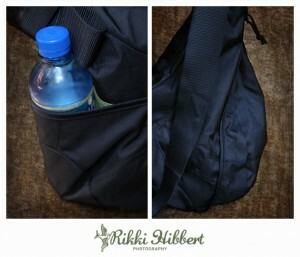 A third pocket is designed to accommodate a water bottle, as we all know photography can be thirsty work. 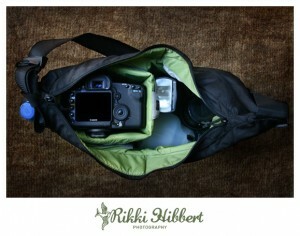 Interior: The padded camera box fits a DSLR with attached lens, and sports a memory card pouch. No more digging to the depths of your camera bag looking for that extra card. The padded box could fit your DSLR and a flash, but I have the rather cumbersome Canon 5D Mrk II, and this utilizes the entire box. The truly awesome thing is that the box is removable, so you could also use the Lowepro Passport Sling as a stylish travel bag. The expandable compartment in the front of the bag zips open to reveal 30% extra space. This space is ideal for personal items, or extra accessories such as a lens, flash, and your flash diffuser. Another 2 pouches on the inside of the bag are perfect for extra batteries and business cards. Overall, I think the Lowepro Passport Sling is great as a daytime or travel camera bag when all your gear is not needed. When we were given the Passport Sling to review we were kind of asked to get the perspective of the more, conservative male photographer. Now I am not so sure just how well I qualify but when it comes to camera bags I think all photographers – whether they openly confess it or not – have a fetish for bags. That said, the last thing you want is to have a bag that is perhaps a little… out of character. When I first had the bag described to me I thought it was squarely aimed at female photographers, and when viewing the Lowepro Promotional Video it only seemed to confirm my suspicion. At the risk of raising an eyebrow or two I took the bag out, walked with it and used it. No negative responses from what I saw and in use it proves to be a bag that is capably functional. I have had but one complaint, sometimes the padded cover for the strap wont stay on your shoulder. Over and above that, I may just occasionally swap my Black Rapid RS straps for this bag.